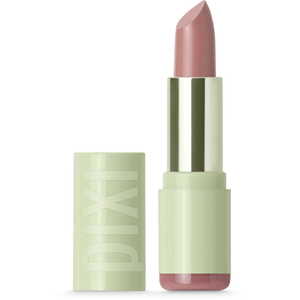 PIXI's Tinted Brilliance Balm is a glossy, gel-balm lip stain that intensely conditions lips and imparts a subtle flush of colour that’s personal to you. Infused with a host of nourishing ingredients, the twist-up balm delivers a protective veil that hydrates and safeguards whilst tinting lips with a hint of colour; depending on your lips' pH, the colour and intensity will differ. Lips feel comfortable and hydrated, and are bestowed with a personalised hue. Twist-up crayon requires no sharpening. Apply directly onto lips, layering for more colour intensity. Secure lid after use. Octyldodecanol, Diglyceryl Adipate/Caprate/Caprylate/Hydroxystearate/Isostearate/Stearate, Polyisobutene, Synthetic Wax, Hydrogenated Microcrystalline Cera, Ethylhexyl Palmitate, Diisostearyl Malate, Candelilla Cera, C12-15 Alkyl Benzoate/Isononyl Isononanoate, Phenoxyethanol, Ethylhexyl Methoxycinnamate, Parfum, Linalool, Limonene, Tocopheryl Acetate, Butyrospermum Parkii (Shea) Butter, Diethylhexyl Syringylidenemalonate/Caprylic/Capric Triglyceride, D&C Red 6 Na. Salt (CI 15850), D&C Red 7 Ca Lake (CI 15850), FD&C Yellow 5 Al. Lake (CI 19140:1).